For years, one of the highlights of my class was the Poem of the Week. Working on fluency, as well as countless oral language standards, the students would memorize a poem each week. Since most of my students each year are primarily English Language Learners, practicing their oral language skills was such an important thing for them. Each Monday, a new poem would be displayed on the pocket chart. The poems were never more than 10 lines...simply because the pocket chart only had 10 slots. ;) The students would copy the poem into their Poetry Journals, and we would set about the task of beginning to memorize the poem. The students would learn the meter of the poem, the rhythm, and the tone on this first day. We would also discuss pronunciation/meanings of difficult words. This would take all of 10 minutes to do. 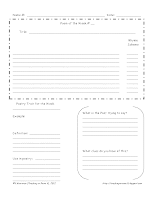 On Tuesday through Thursday, we would begin by determining the rhyme scheme, learning various poetry terms and traits that were evidenced in the poem, and discussing the author's message. All of this was done with the standards in mind, so I would make sure to choose poems containing the right skill set. After the discussion, we would continue to try and memorize the poem. For example, the poem that is to the right has a good discussion on author's purpose. What did the poet mean when he wrote it? How does it relate to my own life? What did the poet intend for me to feel when reading the poem? It also lends itself well to a discussion on summary. Taking the entire Alice in Wonderland story, how was it summarized here? What are the important points? Friday's were always reserved for the recitation of the poem. The poem would be taken down, then, table by table, the students would stand up and recite it. For my mostly EL class, this was a great time for them to practice their oral language. They also really enjoyed performing! Here is the form I used to have the students write the information down. It really is simple. I would hole punch them and use one of the pronged folders to keep them in. That way, each week, the kids could just add this in. At the end of the year, they had a portfolio of about 30 poems! I would recommend these books to get you started with the poems. They all had a variety of poems in them that were engaging enough for the students, yet academic enough to fit my purposes. Shel Silverstein and Jack Prelutsky are also great. Have you used poetry to help the students practice fluency? Please share your routine with us! LOVE it! Thanks for sharing. I started weekly poems this year and use task cards, but I like the worksheet to go with the poems for them to keep in their binders! Much appreciated! What type of task cards did you use? What an excellent idea!! I have been trying to think of ways to incorporate poems into my comm arts class more. Great idea! I'm starting a poetry lesson to grade sixes so I can really use what you've posted :) Thanks for sharing! I'm the newest follower of your blog, a student teacher starting my first practicum in two weeks! I would love it if you could visit my site and follow me back! We are learning about the respiratory system. I have a rather long poem that tells about it; we read it through together, then highlight the words/syllables that are emphasized. We practice it many times and then perform it for the music teacher. The kids are working on fluency, science, poetry, and rhythm all in one activity! Ohh, great connection to science! We are also learning about the respiratory system. Care to share the poem? I am so in love with this. I tried a few poetry things this year and the kids LOVED THEM but I felt like I couldn't keep everything straight so that was something I let go... but next year when I will be a second year teacher (YEAH) I think I am going to for real do poetry! Yay for your second year!!! Whoo hoo!! Oh, I'm soooo glad you posted this. I need this for next year. It's perfect for Common Core. I will pin when Pinterest starts working again. (Grrr..) Thanks! What a great post Steph!!! Poetry is def. something I don't get to throughout the year. I had a hard time with it as a kid too and I guess I shy away from it as a teacher. I plan to create a fun poetry unit this summer to really get the kids to love it and understand it. Thanks for the great resources!!! Do you have one that's been filled in just to give an idea of what a completed form should look like? I love this! Thank you so much! As a primary teacher, I've been doing pocket chart poetry for several years. I also make a copy on the poem on a 8 by 11 sheet of paper, then cut up the poem for the kids to reassemble. I like the idea of them copying it first though. What a great idea, and I can use it as a handwriting practice (since I'm in first), and have them illustrate it for a comprehension check. Thanks for the ideas to bounce off of. I love this! Last year I had two weeks to study poems but this is so much better. Thanks for sharing! I LOVE this!! I was looking for a way to incorporate more poetry in class and this is perfect! What are some of the specific traits you study?